You may have noticed the redheaded, stout Irishman, appropriately named Scott, serving as the new spokesman for Scott Turf-Builder and promoting the concept of reseeding your lawn in the fall. 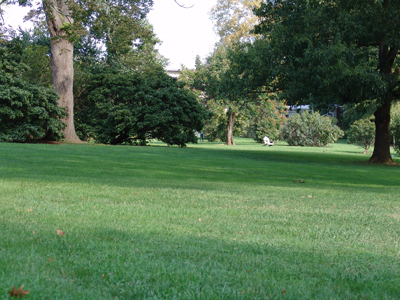 The practice of reseeding your lawn has been an annual activity of turf management professionals for years. 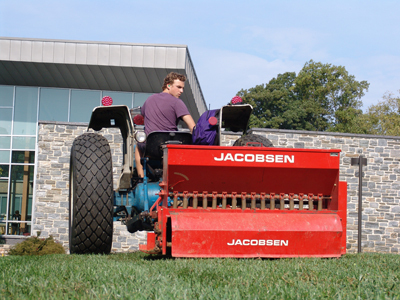 Here at the Scott Arboretum, we are diligently working on our annual fall reseeding throughout the campus. As a gardener, having green swath of lawn allows your eye to rest between the explosions of the color and texture in the garden beds. 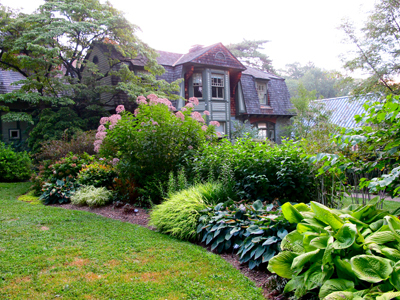 Thus reseeding is a practice you may want to embrace to create a lush green interlude in your landscape. Why reseed? After years of mowing, edging, and compaction, lawns wear out. 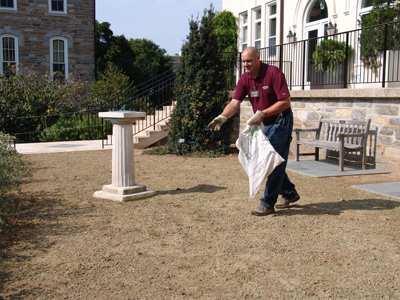 Reseeding on top of your existing lawn is an inexpensive way to revitalize the turf. It allows your lawn to be lush, green, and healthy without ripping out the entire expanse. It is ideal to reseed in the fall because the soil is still warm but the air is cool which encourages good root growth. Organic lawn gardener Nichole Selby offered the following insights about the ideal species of grasses to revitalize your lawn. “To be clear on terminology, tall fescue and perennial ryegrass are species or “types.” Fine fescue are species/types that look alike and can be treated as one group. There are different cultivars/varieties (~bloodlines) within each of those. 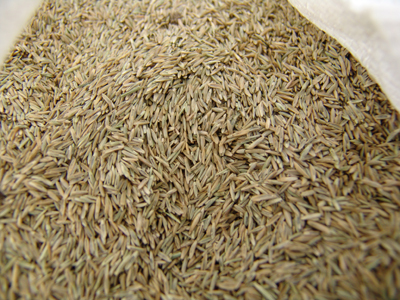 Applying the seed to your lawn is a simple process. You can simply walk back and forth across your lawn broadcasting seed by hand. 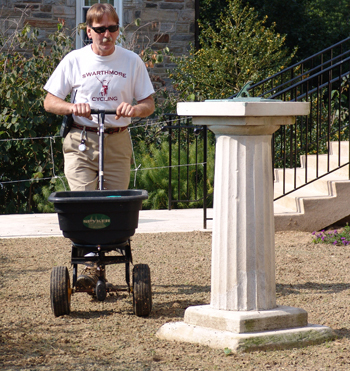 Many homeowners use a basic broadcast spreader to apply the seed. On our larger turf regions on campus, we use a slicer/seeder. This machine plants seeds while aerating the soil. No matter which technique or device you use Gardener Hudson Kalble recommends making two passes with your seed. Each pass should go in the opposite direction to adequately cover your lawn. As Scott would say “Nurse Your Turf” this fall. Not Irish – that accent is from Scotland. Beam me up, Scotty! Thank you for the clarification. I am always poor at identifying accents. Planted Scotts Kentucky Blue grass to a new lawn. Issue is that the seed exposed to sun light more than the shade area(3-4 hours daily)>Has grown faster and better. Some area of the Shade lawn area has some sprouts of grass after 4 weeks.Seed was covered with straw and watered 44 minutes daily. Question do I seed more Kentucky or Sun and Shade seed over the Straw.. When reseeding what to to be done..
Hello Oscar. Kentucky Blue Grass is not especially tolerant of shade, so I’m not surprised that it’s only thriving in the sunnier spots. If it’s only light shade, you might succeed with the KBG varieties Glade or Bensun. Otherwise, try fine fescue if the area is dry, or rough bluegrass (variety Sabre) if it’s wet. Regardless of the type, first move the straw aside. Be sure the soil is not too dense in the top couple inches and has a nice crumbly surface to spread the seed. Then re-spread the straw (lightly) on top. Repeat your good watering routine to help it establish. Good luck!